If the siding on your home is old, cracking, or breaking, you may be struggling to decide what type of cladding to replace it with. 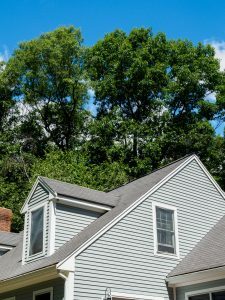 Thankfully, the experts at Clear Choice Home Improvements have served the New England area since our founding in 2004 with the highest-quality vinyl and composite siding products. We are the area’s leading family-owned and -operated installation company and specialize in providing top-of-the-line siding systems that will enhance your home’s curb appeal, energy efficiency, and provide your home with greater protection against storms, wind damage, and moisture. If you desire a siding that can withstand even the worst weather conditions without ever splintering, splitting, or cracking, the Wolf Portrait composite siding that we offer is the right choice for you. Thanks to its InfinitySeam technology you will be able to receive a beautiful wood-grain texture that provides the most moisture protection found in the industry. And, with our proprietary ColorWatch™ cap stock in place, you will be able to rest assured that your siding is blocking all harmful UV rays that would otherwise lead to significant fading. When you turn to the experts at Clear Choice Home Improvements, you will be able to feel confident that you are receiving quality workmanship. Our team of installers are highly-trained siding experts that specialize in this area of the home improvement industry. In fact, we stand by their work and our impressive products so much that we offer an enviable lifetime warranty on all composite siding installations. To learn more about the composite siding that we offer to homeowners in Manchester, NH, and surrounding areas in parts of Maine, Massachusetts, and Vermont, contact Clear Choice Home Improvements today.